Throughout the ages, and even into our present time, India has been known for her sages, siddhas, and saints—great souls who lived in the constant awareness of God's presence within themselves and all around them. During one period in particular, beginning in the seventh century and continuing well into the seventeenth, there was an amazing proliferation of such enlightened beings. Beginning in the South Indian state of Tamil Nadu, the presence of saints gave rise to a wave of devotion to God that grew in magnitude as it spread northward throughout the entire country. These saints came from all levels of society and many different walks of life. They had, however, one thing in common—their loving service to God, whom they recognized in the heart of every being. to fill this entire universe with love for God. One of the ways many of these saints of India glorified the Lord was through the inspired verses of their poems and songs. Throughout the rest of this year, you will have the opportunity on this website to immerse yourself in reading, listening to, studying, and sometimes even singing the poetry and songs that poured forth from the awakened hearts of the saints. Keeping the good company of these poet-saints is one way that you can study and experience Gurumayi's Message for this year. Gurumayi's Message for 2018 is Satsang. As you keep the company of the saints, learning about their lives, imbibing their wisdom, and seeing the world through their eyes, you will be opening yourself to the experience of satsang—being in the company of the Truth. Some of the saints you'll be meeting were renowned spiritual teachers, such as Adi Shankaracarya, the eighth–century master of Advaita Vedanta, and Shri Abhinavagupta, who in the tenth century elucidated the philosophy of Kashmir Shaivism. You'll experience the company of Guru Nanak, founder of the Sikh tradition, and the great Sufi master Hazrat Nizamuddin. Though they were from different spiritual traditions, each of these masters shared the experience that God pervades the world and that all human beings are God's children. Some of the saints taught in Sanskrit, while others—such as Goswami Tulsidas, Jnaneshvar Maharaj, and Eknath Maharaj—broke with tradition, translating great Indian epics and scriptures into the vernacular of the common people. In this way, they made sacred knowledge accessible to all whose hearts longed to experience it. Others—like the shopkeeper Tukaram Maharaj, the housemaid Janabai, the tailor Namdev, and the weaver Kabir—used everyday language and imagery to describe sublime mystical experiences and truths in their songs. Even uneducated villagers and farmers could learn and sing these bhajans and abhangas and, thereby, invoke the direct experience of God's presence as they went about their lives, doing their work and caring for their families. The poems and songs of the poet-saints of India have always held a special place in the teachings of the Siddha Yoga Gurus. When Baba Muktananda was a young monk, wandering throughout India in search of the great being who would reveal the Truth to him, he returned again and again to the state of Maharashtra, drawn in part by the songs of the poet-saints who had lived there over the centuries. Later, through his books and the talks and satsangs he gave as he traveled throughout the world, Baba Muktananda made the sacred Siddha Yoga teachings available to people in all walks of life, in ways they could easily grasp—as the poet-saints had done. Very often, in the middle of a talk, Baba would illustrate a point by breaking joyfully into one of the songs of the saints. Gurumayi, speaking about the poet-saints in A Sweet Surprise 2018, expressed her high regard for these great souls, who inspired the practice of satsang throughout India. Gurumayi's love and appreciation for these saints has long been demonstrated by the way she has made their poems and songs available through her teaching events and recorded CDs. With Gurumayi's guidance and encouragement, many Siddha Yoga musicians have learned to sing the hymns and songs of the saints. During the summer of the year 2000, children and young adults in Shree Muktananda Ashram enacted stories of the lives of seven beloved saints of India. For this series of dramatic performances, called The Golden Tales, Gurumayi set to music, arranged, and sang with the children devotional songs of such saints as Tulsidas, Mirabai, Surdas, and Kabir. These songs have been preserved on the CD, Sounds of the Heart. Today, Gurumayi makes the songs and teachings of the poet-saints available to Siddha Yogis and seekers throughout the world. Furthermore, both Gurumayi and Baba continued the tradition of expressing sacred and subtle teachings through the medium of poetry. Gurumayi's books, Pulsation of Love, The Magic of the Heart, and Smile, Smile, Smile! are all composed in poetic form, as is Baba's book, Mukteshwari. Each of the poet-saints you will meet on this website is an enlightened being, established in the experience of the highest Truth. Through the effects of being in their good company, great numbers of people have come to recognize God's abiding presence within their own lives. The poems and songs these saints created continue to resonate with their wisdom, their vision, and the state of oneness in which they lived. As you read the words of these saints and listen to their songs, I invite you to hold the understanding that you are in the presence of sacred knowledge. Even the simplest bhajan or abhanga is suffused with its author's direct experience of the Truth. Open yourself to receive what these great souls are conveying to you, and give yourself time to notice the effects of doing so. Reflect on how the wisdom of the saints applies to your own life and sadhana. Record in your journal what you learn and experience. It is often said that we become like the company we keep. May satsang with the saints support you to recognize the Truth that exists in every moment within your own being and all around you. 1Swami Chidvilasananda, The Magic of the Heart (South Fallsburg, NY: SYDA Foundation, 1996) p 207. As this introduction makes clear, all the bhajans and other sacred poetry are the description of the poet-saints' experiences along the path of Self- realization. So I now recognize that I must try to understand the actual meaning of such poetry instead of only singing and listening to it. I used to wonder, "Why did they write this poetry?" But now that I understand sadhana better, I have realized that these poet-saints have given these as treasures to other seekers of Self-realization. Sometimes, by describing their own experience along the path, their poetry depicts a milestone in sadhana, which other seekers will find helpful to know about. I thank all these poet-saints for giving us these indescribable treasures. Preparing for the many things I wanted to do today, I felt fortunate to start with a visit to the Siddha Yoga path website. As I read this posting, I experienced gentle love emanating from Swami ji’s words. Images of grace-filled moments in satsangs and retreats emerged from memory, and my heart opened. The wisdom and love I find here makes me want to wish the best and most graceful day to all the world! Reading Swami ji’s beautiful words, I feel joyful and tender enthusiasm and trust in the present and future of humanity. I am so grateful for the current posting of the musical poetry of these wonderful saints. I have listened to Siddha Yoga music for years, having bought the CDs and listened to them often. Now I am hearing them in a completely new way—as part of this glorious community of devoted seekers! So beautiful! With bells, my feet dance to the rhythm of my heart’s song! I can hear the call of divine poetry waiting for me in the company of the poet-saints. I’m coming to dance with you and sing God’s name! I am so grateful to Gurumayi for making the darshan of these saints—from so far away and so long ago—accessible to me now. And through Swami Vasudevananda’s introduction, I have become more aware of how blessed I am to have Gurumayi, a poet-saint of our time, in my life. Ah, the pure bliss of recalling Gurumayi and Baba ecstatically singing these sacred songs! Now I feel I am being called upon to further imbibe these beautiful truths. I love the powerful and direct connection with my heart. I feel immense gratitude to the sages, saints, and Siddhas. Thank you, Gurumayi! Thank you Baba! I am thrilled to think of myself as a member of the ecstatic sangham of the poet-saints. I’m imagining myself traveling around the Maharashtra countryside singing the name of God and dancing in rhythm to the music. I would take my family with me too! 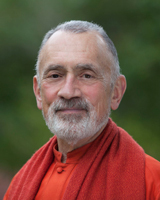 It’s so moving to me to be in this great company now—the company of my own heart, the company of fellow Siddha Yogis via the Siddha Yoga path website, and the company of the saints, whose teachings are coming to life for us today just as they did centuries ago. How wonderful that we’ll be keeping the company of the poet-saints throughout this year! Their poetry and songs delight and inspire me, and I’m very grateful to Gurumayi and Baba for bringing us these great treasures. The music Gurumayi created for many of these poems has enchanted me and made it easier to memorize some of the verses so they stay with me. Sometimes, I suddenly remember one of the verses, and the joy of the song fills my heart. I’m looking forward to taking Swami Vasudevananda’s advice in the coming months—to immersing myself in the songs and poems of these wise, jubilant beings, and recording what I experience in my journal.